^ Weatherbase: Historical Weather for Pohnapei, Federated States of Micronesia. Weatherbase. 2011. Retrieved on 24 November 2011. ^ 5.0 5.1 Flood, Bo; Strong, Beret E.; Flood, William. Micronesian Legends. Bess Press. 2002: 145–7, 160 [1 January 2012]. ISBN 1-57306-129-8. ^ Hanlon, David L. Upon a Stone Altar: A History of the Island of Pohnpei to 1890. Pacific Islands Monograph 5. University of Hawaii Press. 1988: 13–25 [1 January 2012]. ISBN 0-8248-1124-0. ^ Panholzer, Tom; Rufino, Mauricio. 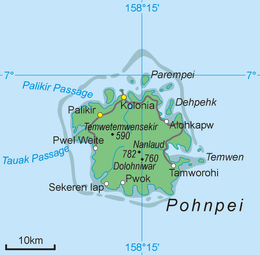 Place Names of Pohnpei Island: Including And (Ant) and Pakin Atolls. Bess Press. 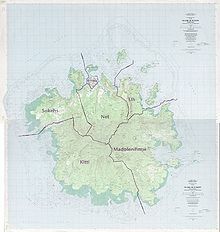 2003: xiii, xii, 101, [31 December 2011]. ISBN 1-57306-166-2. ^ 8.00 8.01 8.02 8.03 8.04 8.05 8.06 8.07 8.08 8.09 8.10 8.11 Riesenberg, Saul H. The Native Polity of Ponape. Contributions to Anthropology 10. Smithsonian Institution Press. 1968: 38, 51 [1 January 2012]. ^ Ballinger, Bill Sanborn. Lost City of Stone: The Story of Nan Madol, the "Atlantis" of the Pacific. Simon and Schuster. 1978: 45–8 [31 December 2011]. ISBN 0-671-24030-7. ^ 14.0 14.1 Takizawa, Akira; Alsleben, Allan. Japanese garrisons on the by-passed Pacific Islands 1944–1945. Forgotten Campaign: The Dutch East Indies Campaign 1941–1942. 1999–2000. ^ Lovecraft, H.P. Out of the Aeons. [16 July 2014]. ^ The Micronesian Elvis. Dunce Upon A Time. 30 August 2007 [17 August 2009]. （原始内容存档于2008年12月2日）.